If you’re one of those unfortunate souls who has to manually remove snow from the driveway and walks every winter, you may want to reconsider your methods. The passing of new snow removal laws (as in Massachusetts) don’t make it any easier on homeowners, who are now mandated to provide snow and ice-free walkways for pedestrians. If the sidewalks are not cleared, property owners are not only susceptible to personal injury lawsuits, but they also face the possibility of fines, levied by the local government. Removing snow from your driveway and sidewalks is no longer an option – it’s the law! Many consumers stock up on salt and other snow melting chemicals to ease the physical burden of shoveling the snow, but the amount of time, money and adverse environmental effects of these chemicals can be evident year round. While effective in melting snow, salt and chemicals are not so friendly to the surrounding landscape. 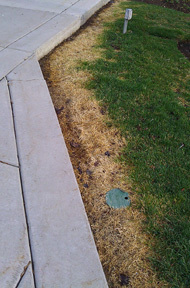 When spring hits, the bordering grass and shrubs often reveal the ugly scars from the repeated salt and chemical use during the winter. Of course, one of the most significant “selling points” of radiant snow melting systems is that it eliminates the time consuming, physical demands of the homeowner. The best time to purchase and install a snow melting system is during the early spring. You are much more likely to discover discounted prices, because the demand typically wanes when the weather begins to warm. Springtime is a time when homeowners are more interested in outdoor grills and barbeques than snow melting systems. Of course, once the summer has run its course and Old Man Winter is peeking around the corner, consumers tend to scramble to install a snow melting system before the first storm hits. While snow melting systems have become more affordable, installing a system should still be done with careful consideration. Do some research and deal with experts who will openly talk to you about the various products available. Don’t be fooled into thinking that some provider has the ready-made system that is perfect for your needs. You need unbiased professionals. Talk to the experienced radiant heat staff at Warmzone and learn the “how’s, what’s and why’s” before you make any decisions. Warmzone is a trusted, leading provider of radiant heat systems, for good reason. We’ve been around a long time, and we offer a wide variety of proven systems from only the most reputable manufacturers. We’re not “locked in” to selling one brand or “one size fits all” system. In fact, Warmzone provides customized solutions for all of its customers, and works within your budget. We engineer, design and review every aspect of your project so that your system meets your needs, while keeping within your budget. If you are serious about the environment and looking for a “green” solution for snow melting, look no further than Warmzone. Call 888.488.9276 today or email. Owning and operating a business is serious business indeed. Your top priority besides making tons of dough is to keep things running smoothly and safely for all involved. If you own a large building or warehouse you are extra conscientious about keeping things moving at full steam ahead. Frozen pipes during the brutal winter months is a legitimate concern, one that savvy business owners are aware of. Commercial, municipal, and industrial buildings all need pipe tracing to protect pipes during dips in temperatures. Pipe freeze prevention is one of the first necessary investments you must make when your property is up and running. Pipes should be equipped with electric heat trace freeze protection for optimal temperature maintenance. In the long run, having pipe freeze protection will save you from costly repair and sometimes irreversible damage to inventory, equipment, and property. Pipe freeze protection systems can be used with both metal and plastic water piping. In the coldest months where pipe freezing is a real danger, the self-regulating heat cable adjusts heat output in response to ambient temperatures. The power output increases or decreases in response to ambient temperature changes. This even occurs at each point along the length of the pipe trace cable effectively adjusting the power output in varying degrees along the length of the pipe. The design and intent of the self-regulating systems ensures safe and efficient operation. Operating your business safely is a whole lot easier with pipe trace cables. Warmzone stands proudly by the quality of our products and services. Our radiant heat products are tested and proven to be among the best in the industry. Call Warmzone today. Your initial consultation and project estimate is absolutely free. For more information on pipe tracing, radiant heated driveways, radiant floor heating, or roof deicing and gutter trace systems, browse our web site or call 888.488.9276 today.